Light to medium weight fabrics are recommended, such as cotton, silk, lawn, voile, charmeuse, crepe de chine, or wool crepe. Craftsy is one of my favorite sources for fabric, patterns, and notions. The sewing kits are particularly a great value. Usually I can pick up fabric AND the pattern for less than what the yardage would cost alone. 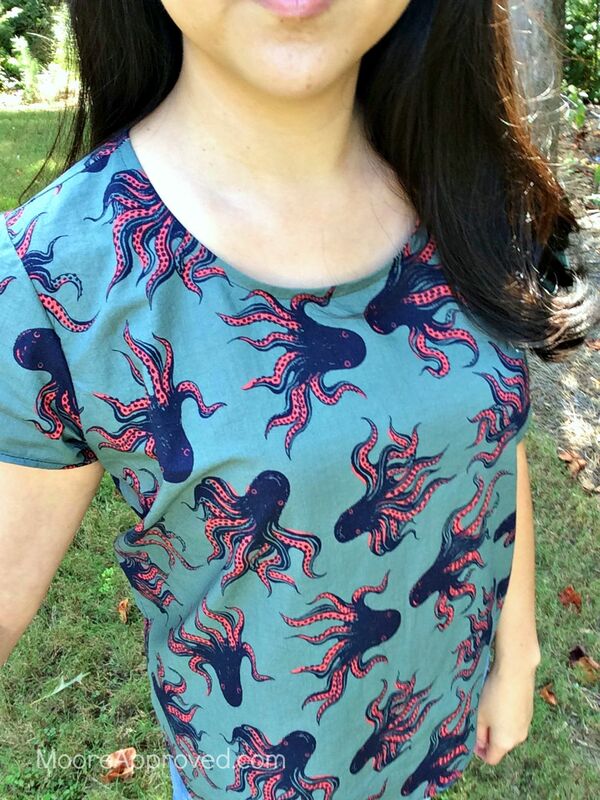 The kit purchased was the Grainline Studio Scout Tee Kit in Cotton + Steel Tokyo Train Ride Octopus in Teal. (AFFILIATE LINK) Price will vary depending on what sales or promotions the company is offering. For my shirt, I settled on size 4, despite the fact that my waist sure isn’t 27 inches! I’ve noticed with clothing patterns that if I choose a size for my waistline, it ends up being too large. Judging from others who had made the pattern, the Scout Tee had enough ease to still fit me. The size 4 bust and hip measurements were spot on, so I went for it! I can’t tell you how thrilled I was to have a real paper pattern! Many of the indie paper patterns I’ve bought were printed on regular paper. LOVE that Grainline Studio patterns are printed on real pattern tissue. What I do is place a piece of tracing paper over each piece and draw out new pattern pieces, so that I’m keeping the original intact in case I should change sizes or want to make this for someone else. A while ago, I picked up a large roll of Bienfang Sketching and Tracing Paper on Amazon. (AFFILIATE LINK) It will definitely last a long time, and has quite a few uses in the craft room. The Scout Tee is such a simple, but versatile pattern. You could make dressier tops, or stick with the basics. With only four pattern pieces, it’s not overly complicated. 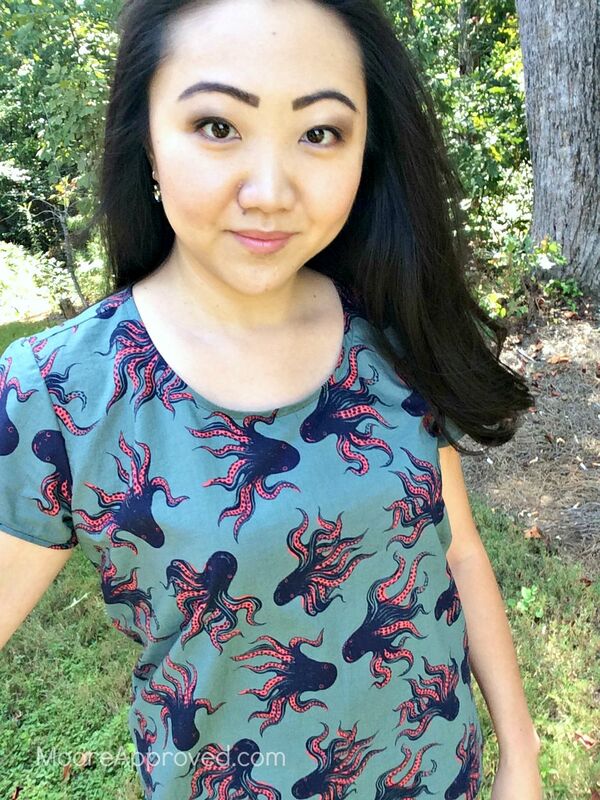 Grainline Studio founder Jen has posted quite a few hacks and tutorials to the pattern on her blog. One thing I’ve found extremely frustrating with constructing tops with sleeves is setting them in. Setting in sleeves “in the round” does NOT yield satisfactory results for me. Even following tips like running two basting stitch lines and gathering the fabric has not worked well. Needless to say, I was somewhat apprehensive about the sleeves on the Scout Tee. 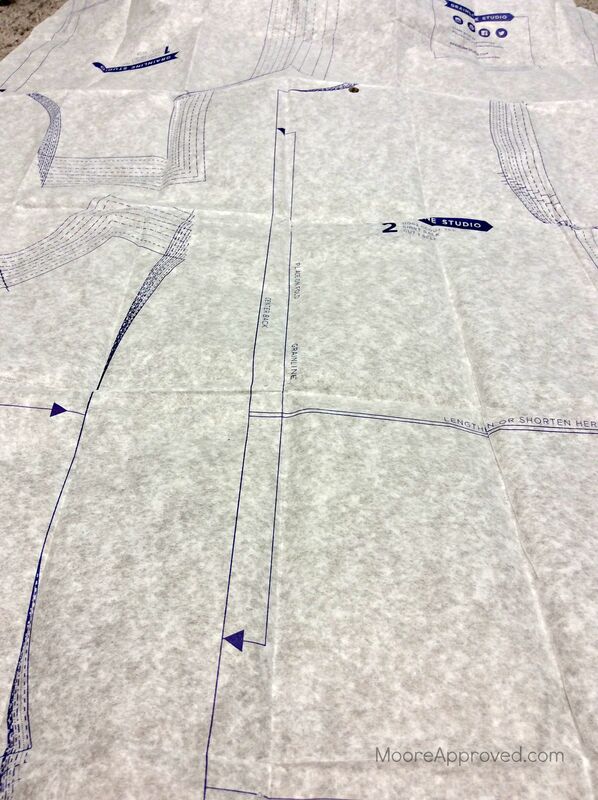 I’d seen tutorials and other sewists discussing setting sleeves in flat, before the side seams of the garment are sewn. 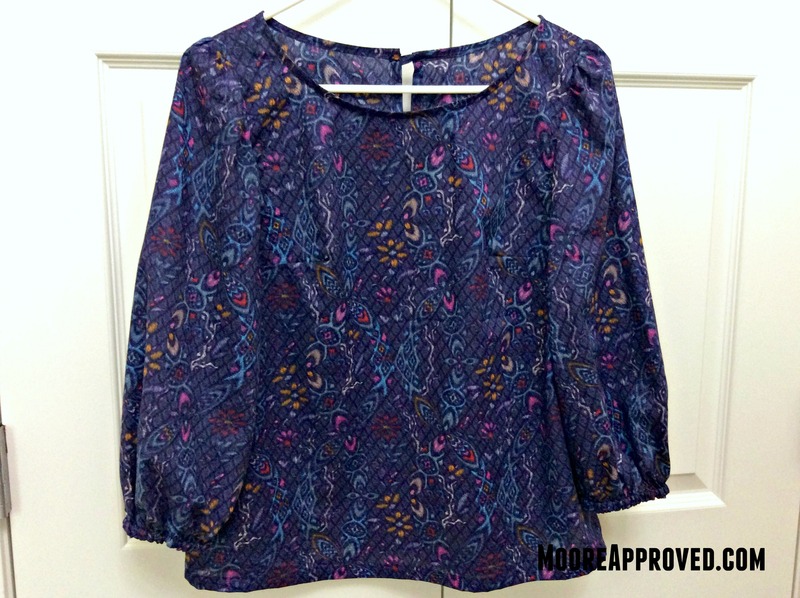 Instead of following the instructions, I attached the sleeves right after the shoulder seams. This does take some patience, a gazillion pins, and a lot of time. Before locking the seams down permanently, I basted them first. Glad that I did, because there were a couple spots where the fabric puckered. I would seam rip in that area, and make sure to ease the fabric in for the second attempt. This method actually ended up working for me. For the first time ever, I had PUCKER-FREE SLEEVES!!! Maybe I shouldn’t get so excited about that, but I truly am. From cutting out pattern pieces to slipping on my Scout Tee, I’d estimate about five hours for total construction time. I used my sewing machine for the seams, and then serged the raw edges once I confirmed the fit. It’s awfully hard to rip out a serged seam compared to one sewn on a domestic machine. Some reviewers of the Scout Tee pattern reported issues with the neck line laying flat, but I didn’t encounter that problem – possibly because I did stay stitch the neck line to eliminate unnecessary stretching. This pattern would be fine for a beginner, as long as you don’t rush and read the instructions carefully. I would recommend setting the sleeves in flat, as I feel it will produce a better finished garment. I’ve noticed with Grainline Studio patterns – they tend to be very flattering to my figure (smaller upper body, slightly rounder at the waist/hips). The shirt slips on and off fairly easy, which I was worried about because the fabric does not have much stretch. Compared to the Linden Sweatshirt, the degree of difficulty is similar, although owning a serger really speeds up the process for the Linden. Since making the Scout Tee, I’ve already worn it to work twice. It doesn’t have the “homemade” look, and I can definitely see myself making this in other substrates. 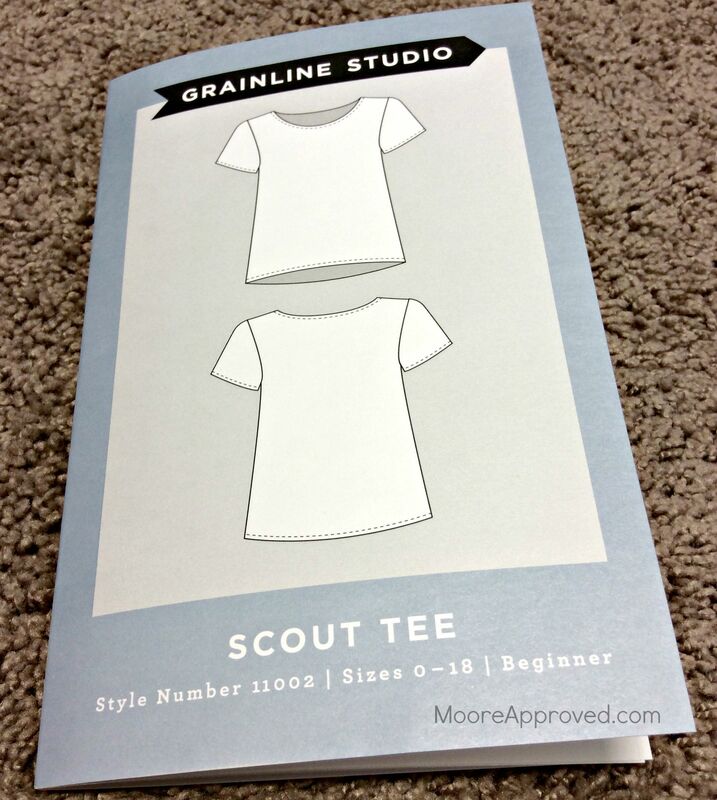 3 Responses to "Pattern Review: Scout Tee by Grainline Studio"
I hate the sleeves from Scout Tee and the rest of commercial pattern who draft the sleeves circumference way too big compare to armhole. I measure size 10, the front section of sleeves is 5cm bigger, the back section is 3cm bigger compared to that in the armhole. The total difference should be no more than 2.5cm or 1 inch! That’s the culprit, not our sewing! I sew the scout tee sleeves flat . I hate the gather. I agree they are too big at the top. I put the tallest point of the sleeve against the shoulder and pin from there to the arm pits. I have to cut a triangle of sleeve out of each armpit. I then sew the sleeves and the sleeve arms. I wish the sleeve pattern was smaller. I am wondering if I should cut the top of the sleeve in a smaller size. I use size 10 for the body. Maybe I will try a smaller size sleeve top. Has anyone tried this?